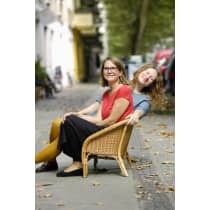 While searching for a space for their soon-to-be-launched childrenswear boutique, Alessandra Cioni and Meike Badi-Wiese fell in love with a charming building on Berlin's Danckelmannstraße. With its Art Nouveau tiles and calming atmosphere, they knew it would be the perfect place to house Kiri & Jule, a curated kids' shop dedicated to slow fashion. The boutique primarily stocks products from small labels based in Germany, Italy and Holland, which enables Alessandra and Meike to tell customers exactly where and how each item is made. "We originally decided to start our own business because we wanted to be independent and free. Owning our own boutique allows us to be in direct contact not only with the customer, but also with all of the amazing brands we stock."